Today on HN there was a thread on how to get the Facebook share counts for a URL. Turns out that with Facebook, just like with most social web services this is quite easy. 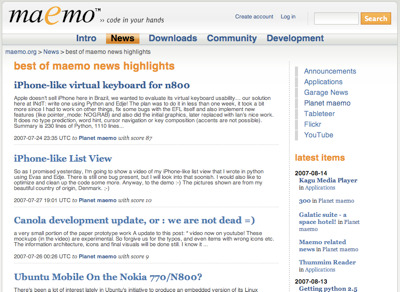 And actually I've been doing this since 2007 to calculate news item relevance on Maemo News. Grab the source from GitHub. I'd be happy to accept pull requests adjusting the weight scheme or adding new social sources. And if you want to run a "Planet" in similar mode to what we have on Maemo, providing a quick front-page view of only the most relevant posts, and a separate page of all posts, then the repository has a full Midgard MVC component for doing that.